If this sounds mad or crazy you might well be right. But you are unlikely to be as mad and even downright angry as those who run small online businesses. You see many thousands of people have set up small businesses to supplement their income. Nothing fancy just little money making projects like those envisioned by the Money Making Parlour website that we were going to invest more time and effort in developing during 2015. In November 2014 a bomb was dropped on them. It was suddenly realised that the changes in the VAT regulations that were due to come into force a few weeks later would have a severe impact on them. Many of us in the UK had an inkling that things were going to change but for OTHER people, surely we were too small to be affected. We were wrong. No one was too small. Sell a single product for a few pence to someone in one of the 28 countries in the European Union after the clock struck midnight and the New Year started you had to collect VAT on it. Well it is difficult to charge 20% VAT on a product that is less than 5p. But sell an image or a knitting pattern or a variety of other online products to a buyer in the EU and the law says that starting from 1st January 2015 the seller has to collect VAT and give it to the tax authorities in the country where the buyer lives. What is worse that 20% rate I mentioned is only the UK rate. Each of the 28 countries has its own VAT system that divides products up into different categories and that has different VAT rates. So the same product might need to have anything from 17% to 27% added to it. Any whole number that is from 17 to 27 but not 26 for some reason. Work out where a buyer is before they actually buy something so that the right amount of tax can be collected from them. In effect this means having 11 different sales pages for a product. Well maybe more but this is taken from one particular example product I found online. One would show the price without VAT and the other 10 would show the price using 1 of the 10 possible rates of VAT. Gulp! Most small business websites are incapable of this kind of mindreading ability. They could, with some help, work out where someone was after they bought something. Knowing where they were beforehand is far more difficult to work out, if it is even possible. Then they have to gather enough information about everyone who buys something from them to keep the tax man happy. Tricky one that as they can be very precise about what they will accept and what they won’t. Then every three months they need to use that information to submit quarterly reports about how much VAT was paid and where the buyer lives. So you might sell a 5p product and have to charge 1p VAT and spend a few hours dealing with the VAT. BTW this tax collecting lark is all unpaid work. On top of all that they need to keep that information for 10 years so that the taxman can come and have a nose around and check everything has been done correctly. Of course, it has to be stored in such a way that it stays accessible to the right people when needed regardless of technology updates. And kept safe from prying eyes who might want to use it for malicious purposes. To be frank God only knows! Seriously! 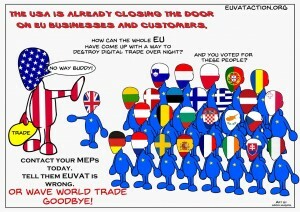 Some say why not just stop selling things to those in the EU. This has been happening and the cartoon below is a response to those who have taken that option. Being on the receiving end of such behaviour I know how uncomfortable this leaves a customer. Yes, you are not rejecting someone for who they are, but for what their government is doing, but it is still rejection. Others say find a third party marketplace or sales platform who will either gather the information you need or even take over the whole responsibility for dealing with VAT for you. To be honest this is far easier said than done. Some of these third party providers have looked at the work they would need to do and said sorry we do not want to get involved in this. It is too much work. We would rather discourage people from selling things to people in the EU than do all that it takes to comply with the law. Thankfully a handful have tried to make it possible for those in the EU to comply with the law. Some do all the work themselves and others do part of it and leave the seller to complete the rest. The problem is finding a third party supplier who does not charge the earth and who will enable you to make the best use of what you have already done. It is surprising how many new marketplaces or sales platforms I have discovered as a result of working through this situation. I have looked at some I had never heard of before and realised I had missed out on some that were worth using. It is interesting to see how different organisations have responded. Some have done so quickly after customers asked for help. Others have developed selective deafness. Those who have been helpful have definitely gone up in many people’s estimation. At least those who sell digital products in the EU will be ahead of the pack. There are rumours of other countries doing the same thing i.e. expecting sellers from overseas to act as unpaid tax collectors for them. There are rumours that the same change in the way VAT is collected will be applied to physical products in 2016 so everyone who sells something to someone in the EU will be impacted. By the time those future changes come into those affected by these changes will be in a better position to cope with them and to help others cope with them. Remember that cartoon I included earlier, do you know what it reminded me of? The horrors of protectionism of the 1930s. A time when various governments tried to protect their own economies using customs duties or import duties i.e. a form of taxation on things that moved from one country to another. Another thing I thought of from the same period was how certain groups were demonised and seen to be in need of special attention. The 1930s was the era of eugenics when many were talking about cleaning up the population by stopping certain bloodlines. Often this involved surgery to stop reproduction but this was only the forerunner of the horrors of Auschwitz in the 1940s. It started as an excusable drip by drip effect but ended up in a torrent of virtually inexcusable behaviour. Why this association? The reason given for this taxation change was that some of the big companies needed to be brought to heel. It did not matter that they had followed what was sensible business advice, some of which seems to have actually come from sources within the EU itself. They were made to look like the bad guys and they needed controlling. Umm wasn’t that exactly what happened to both disabled people and the Jews in the 1930s and 40s. Made to look bad and then special measures taken against them. Things happened to them that we now look back at with horror. This scares me as who knows where this demonisation of business will take us. Moving forwards a bit, at the end of the 1980s the old men of the church used to tell me that there would come a time when buying and selling would become harder because of the amount of control it was subjected to. They are dead now but I can almost hear them say I told you this would happen. The idea of killing off some of the little guys and gals and directing those who are left to go through a limited number of channels looks suspiciously like the early stages of this kind of process. It looks like the explainable even excusable drip by drip process happening again and who knows what the torrent will look like in the future? How do we stay alive and help others stay alive despite the darkness? It is tough. In fact looking at the whole VAT scenario is very depressing. It is squeezing the life out of many micro-businesses. Some are doing things in a different way so that they can survive for a bit longer. Some are have not been able to find a way forwards. Some have stopped trading completely or just selling certain products. Some are going to sleep for a while and expecting to wake up when the darkness has eased a bit and the way forwards seems more obvious. Some are taking on the challenge of trying to comply with the law. There is a fighting spirit in many business owners that will help them overcome in the end but they need your support. Those who run them need a friendly shoulder to cry on and once they have done that they need strong supporters beside them to help them stand tall again. Surely you can do that can’t you! PS If you don’t know anyone personally who is affected just continue to buy the knitting patterns and online courses and ebooks that you used to enjoy and support them that way. We are now going through all the trauma of Brexit. No one knows what on earth how it is all going to work out in the end. Yet as this is going on the finance ministers of Europe are working on a plan to make this law less damaging to tiny businesses. The hope is that these new regulations will make it possible to operate a small business.